So last night was the first time I think fear had been felt across London and with the Bush coming off comparatively unscathed from the senseless rioting and looting, I think many of us breathed a sigh of relief this morning. Having spent most of the night awake refreshing my Twitter feed and listening to the sirens and helicopter above wondering and thinking the worst, as my alarm went off this morning I grudgingly stumbled out of bed. Literally stumbled, as I tripped over my laptop (thankfully unhurt) cutting and twisting my ankle. Brilliant. Ah well, the pain and subsequent need to work from home has proved a very useful distraction. Just like last night when I couldn't sleep, my new obsession with photo editing using (or trying to use!) Gimp kept my mind off the sheer lunacy going on in parts of London I know and love well. 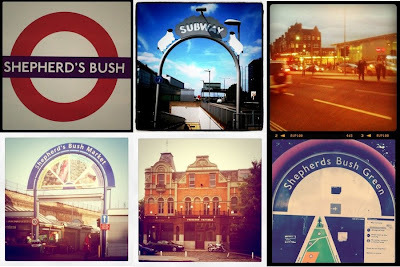 It was nice to sift through many lovely photos of Shepherd's Bush at such a chaotic time. It needs a fair amount of tweaking (I was half asleep!) but I'm thinking of using it as a new blog banner? What do you think? Very cool How are you getting on with Gimp? I think it looks pretty good... For a blog banner, is there any way you can put "Bird in the Bush" over it? Mr Northerner - I have experimented with the writing over the top but the problem is I can't seem to make my font of choice (Riesling) bold, which means it blends into the background a bit too easily. Will keep trying or maybe find a new font! !